This magnificent orchid was spotted in the grassland recently. 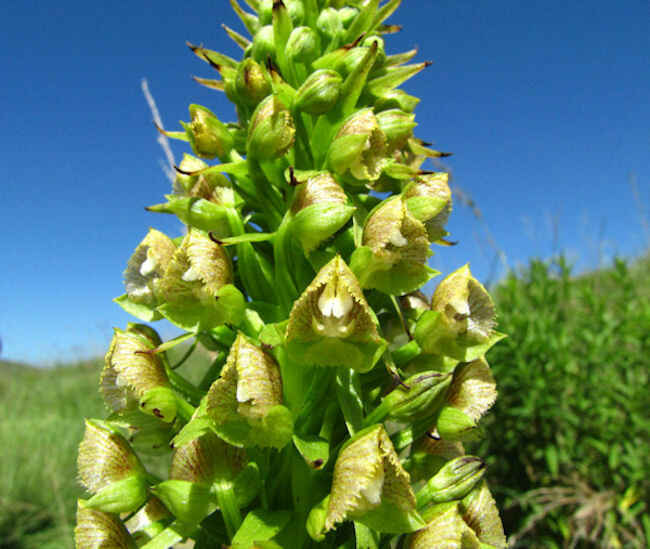 There are 52 genera of orchid in South Africa – some of which grow in trees, but mostly they are found in grasslands. Pterygodium magnum is the largest terrestrial orchid in South Africa. Most of the 18 local species occur in the Western Cape, with four in KZN. It is usually found in damp grassland, often growing amongst Leucosidea sericea (ouhout). The narrow, lance shaped leaves (bracts) are borne along the stem, which can be up to 1,5m tall. The inflorescence is made up of densely packed greenish-yellow flowers with purplish-red veins and dots. Another tall grass orchid, Disa crassicornis has flowered spectacularly this year – the large flowers are pale pink with purple spots.